You might want to sit down for this one and take some Dramamine. You are going to need it. What planet or parallel universe has President Obama been living on or in the past 4 years? 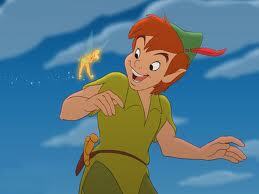 This borders almost on the Peter Pannish-level of 'Neverland' where all you have to say is: 'I won't grow up!'... and you don't. 'The American people will not allow too much debt or too much spending to occur, however. They are simply not that stupid and reckless to allow it to happen'. They were all wrong, weren't they? 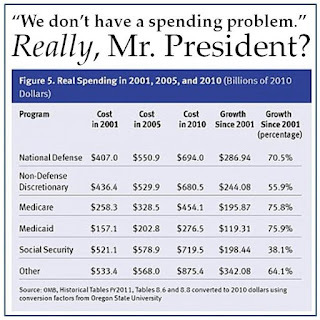 As you can see from the following chart, and President Obama could easily see if he ever read one, defense spending is up 70.5% since 2001; non-defense, non-entitlement spending is up 60%; Medicare and Medicaid are both up close to 76%; Social Security is up 38% and 'other spending' is up 64%. All during a time when inflation was generally tame and the CPI is up 28% total for the nation. We American citizens have allowed it to happen and not punished our elective leaders for spending over $16 trillion more than they have allowed to be collected in tax revenues. Both Republicans under Bush 43 from 2001-2007 and Democrats under Obama from 2009-2011. 'Increased our collective publicly-held national debt levels from 35% of GDP in 2000 to over 70% of GDP today and climbing steadily higher to what many believe to be dangerously high levels that any sane society would be prudent to avoid'. The twin siren calls of lower taxes for (most) everyone and higher federal government spending for (most) everything under the sun in America from undeclared wars to welfare to education, environmental protection, roads, space travel and entitlements has proven to be too much to resist from elected officials on both sides of the political spectrum. 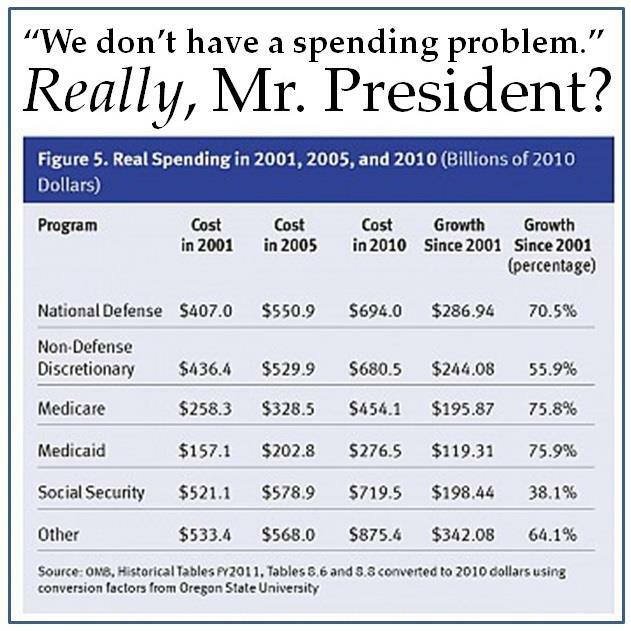 Is it even possible for anyone, including President Barack Obama, to assert that 'we don't have a spending problem' in America today? We will try to be charitable but still count the ways that this is simply beyond the pale of plausibility for any sane person and debt-denier to say. Let's presume that we had been in a 'normal' economy for the past 4 years, not the recession-laden one we have all experienced. Perhaps, just perhaps, that if we had not had the Great Recession, we might have a GDP approaching $18.2 trillion today instead of around $15.8 trillion, a drop of 13% from 2007 projections. Our level of federal spending of $3.7 trillion would approximate 20.3% of GDP instead of the over 25% of GDP it has been virtually during the entire Obama Presidency. So far. That would not be so bad, would it? In fact, that would be terrific! 18.5% of GDP in federal spending has been the dream of every budget hawk that has ever worked on or even looked at the US federal budget. A few spending changes and reforms and the level of federal spending would be close to what it was during the vaunted Golden Age under President Bill Clinton that President Obama always brings up in his public pronouncements. The problem is that not only have we had a crushing recession, we are now looking at substandard historical growth in the US of around 2% or less for the rest of our lifetimes! Consensus GDP growth rates ranged from 3.5-4% per year in 2006 for the next decade. Now, many economists expect 2% annual growth, a difference of between 1.5-2% per year for a long, long time. Every time we raise taxes or increase our national debt, economists predict another .1% or .5% or 1% of GDP gets shaved off of potential growth. Right at a time when we need more economic growth, not less. If every single discouraged worker who has left the workforce over the past 4 years due to lack of success in finding a job re-entered the job market tomorrow, the unemployment rate would skyrocket to over 11.5% according to most independent economists and forecasts. That is not good. So continue to be a debt-denier all you want and try to pooh-pooh the deleterious effects of both higher taxes and increased debt on the American economy. The facts are that both higher taxes and more debt push down the chances for a robust recovery, not increase them. Right now, we have a President in the White House, President Barack Obama just to be clear about who it is, who is in complete denial about the need to rein in spending. Instead, he is enamored with spending far more, not less at the federal level which means more taxes and more debt, not less. The heck of it is that all fiscal conservatives and responsible budgeteers want is modest reforms and reductions to projected growth rates in the future, not a wholesale slashing of current fiscal year spending. Instead of federal spending growth rates in the 5-6% annual range, we would like to see it grow at 2.5% per year overall and be more in line with the reality of inflation expectations. Two areas in the US economy with higher growth rates than the federal budget? Health care and higher education, both compounded at 2-3 points higher than the inflation rate annually for the past 25 years. There is hardly a case in recorded history over the past 800 years where high taxes and exorbitant debt in any sovereign nation turned out real well for the perpetrators. As in 'none' according to liberal economic historian, Ken Rogoff of Harvard University. We don't have an $20 trillion GDP economy today. We are very unlikely to have one under President Obama's second term either according to CBO economic forecasts which are 'generous', to say the least. Given current economic prospects and the headwinds set up by the very President who should be trying to encourage economic growth, we are more likely to see stifled economic growth instead. What part of that is so hard for President Obama and Nancy Pelosi and Harry Reid to understand? Are Health Care Costs (Shudder!) 'Moderating'? When Is 'Compromising' Not 'Compromising'?